Lobbying is a crucial piece of political activism that often goes undiscussed and unrecognized. 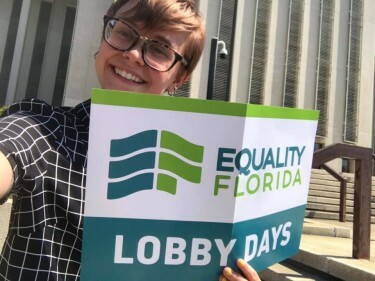 Recently, I was given the opportunity to participate in Equality Florida’s 2019 Lobby Days-- a two day event held in Tallahassee that gives everyday citizens the chance to meet with their representatives and create comprehensive change. Going into this experience, I was completely unaware of what to expect. I am relatively new inside the world of activism, I have always been passionate about civil rights issues but my internship with Equality Florida has opened doors and given me a tangible platform to navigating LGBTQ legislation. I was also thrilled to participate in such a hands-on experience. As the Communication Intern, I help our department do the heavy lifting behind the scenes in order to make sure Equality Florida operates cohesively internally and externally. Lobby Days was a huge contrast to this, and being able to see both sides of the process has allowed me to create a holistic picture of what it means to be an activist and a grassroots lobbyist. The biggest lesson I took from lobbying is that it is not a glamorous process. Lobbying is not eye-catching like protesting-- walking the capitol building end to end involved uncomfortable interactions and being turned away by representative aids. This rejection, however, paled in comparison to meeting supportive and caring representatives ready to show up for LGBTQ Floridians. Being at the capitol is incredibly daunting-- seeing the rapidity of the legislative system initially made me feel alienated and outside the power to create change. Once we met with legislators, however, my attitude was completely flipped on its head. The people we met with quickly worked to make us feel comfortable and were open to discussing the bills we had in mind. 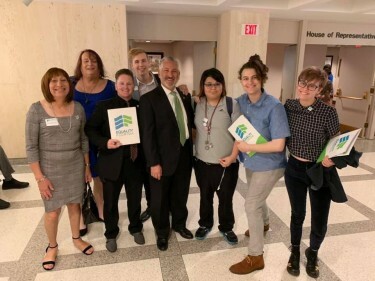 We mostly focused on garnering support for the Competitive Work Force Act, (HB 485 and SB 430) which would provide workplace, housing and public accommodations for LGBTQ Floridians on a statewide level. It was amazing to observe the supportive responses we received, and lobbying for this bill taught me that civil rights protections can be accomplished in a non partisan manner. Overall, Lobby Days 2019 was a fulfilling and eye opening experience. It was incredibly empowering to be able to meet my representatives and foster a personal connection with them. Comprehensive change can often be a slow journey filled with roadblocks and opposition. Observing the progress made by lobbying is a reminder that no step is too small to make a difference. Watching the sheer number of people who travelled hours to volunteer reminded me that LGBTQ citizens are a force present far and wide in the state of Florida. I will always be grateful to Equality Florida for providing me with the chance to participate in such an impactful experience. I am looking forward to volunteering in the future, and will always remember these two days as the beginning of my involvement in the fight for LGBTQ rights in the state of Florida! Ava Borchuck is the Communications Intern at Equality Florida. She is currently a freshman at Florida State University, perusing a dual degree in both Creative Writing and Women’s Studies.